This lovely lemony gold Citrine Radiant Heart Pendant radiates a golden glow! The Radiant Heart pendant is a powerful design from the creators of the Flower of Life and Magician Stone pendants, who call it an "evolutionary tool to assist us in expanding our ability to hold and create Unconditional Love, so that we too may 'crystallize' the wisdom of the One Heart that unites all life in Love." Read about citrine in our article on ametrine, one of the semi precious stones in ametrine. This gorgeous citrine radiant heart is set into a sterling silver setting which allows the stone to breath, and hangs on its sterling silver chain right on the heart chakra, offering protection to the whole body resonating through the compassionate heart. 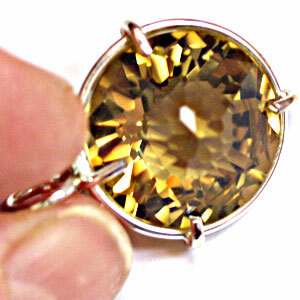 This citrine in this pendant is a warm and rich shade of gold. Note: Weight above is shipping weight. Actual weight of this pendant is .20 oz. Each piece may vary slightly in appearance and is guaranteed to be beautiful and to meet with your complete satisfaction!